Revenue in the Apparel segment amounts to US$390,975m in 2019. Revenue is expected to show an annual growth rate (CAGR 2019-2023) of 10.1%, resulting in a market volume of US$575,163m by 2023. 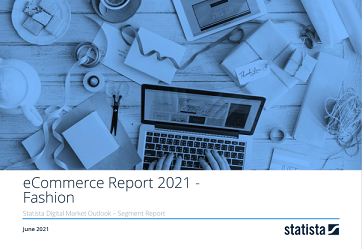 User penetration is 33.3% in 2019 and is expected to hit 44.0% by 2023. The average revenue per user (ARPU) currently amounts to US$159.47. In global comparison, most revenue is generated in China (US$183,181m in 2019). The eCommerce market segment Apparel covers the digital sale of almost all types of clothing items, including men, women and children apparel (+4 years), underwear, costumes and workwear . Toddler and baby clothes, sport and outdoor clothing as well as jewelry are not included in this segment. The main sales channels in this market segment are multi-brand merchants (e.g. asos.com, nordstrom.com) and the online shops of individual fashion retailers (e.g. zara.com). All monetary figures refer to the annual gross revenue and do not factor in shipping costs. Reading Support Revenue in the Apparel segment amounts to US$390,975m in 2019. Reading Support The Apparel segment is expected to show a revenue growth of 13.7% in 2020. Reading Support In the Apparel segment, the number of users is expected to amount to 3,362.9m by 2023. Reading Support User penetration in the Apparel segment is at 33.3% in 2019. Reading Support The average revenue per user (ARPU) in the Apparel segment amounts to US$159.47 in 2019. Reading Support In the year 2017 a share of 32.6% of users is 25-34 years old. Reading Support In the year 2017 a share of 55.9% of users is female. Reading Support In the year 2017 a share of 37.7% of users is in the high income group. Reading Support With a market volume of US$183,181m in 2019, most revenue is generated in China. Reading Support With a rate of 67.3%, the user penetration in the Apparel segment is highest in United Kingdom.